Hong Kong really is a great destination for satisfying beauty lovers and shopoholics alike. Filled with streets upon streets of boutiques and mega malls it has many exciting shops and brands just waiting to be discovered. I recently stumbled upon a Korean Beauty Brand Innisfree whilst wandering the streets of Mong Kok. I was attracted by the clean layout of the shop and the simple designs of the packaging and products. For those who are not familiar with Innisfree, the brand is strongly focused on natural ingredients and eco friendly packaging. Their range boasts a selection of Skincare and Beauty lines that features ingredients cultivated from the volcanic island Jeju. After a quick browse through the store, I picked up one of the Eco Nail Colours in #121 amongst a few other bits to include their best selling Jeju volcanic pore clay mask and the Air Skin Fit BB Cream. I will in turn review each of these but I will start with the Nail Polish first. 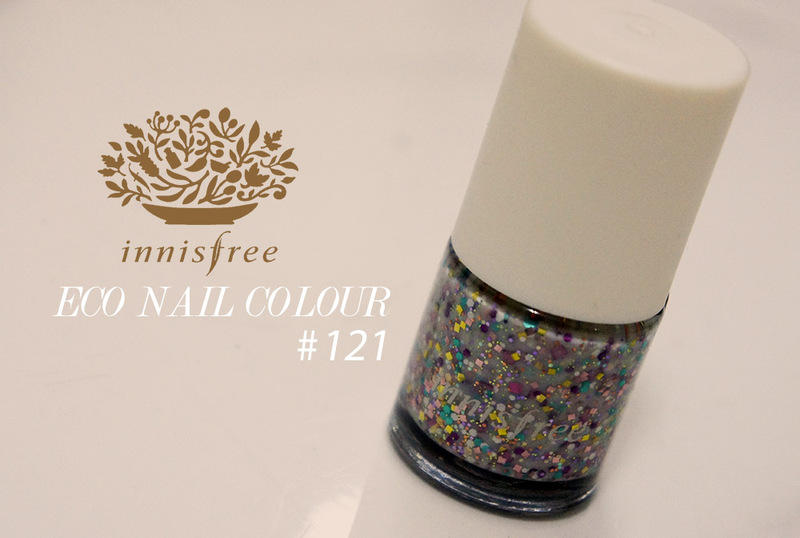 THE PRODUCT: INNISFREE ECO NAIL POLISH. Iwas spoilt for choice when it came to shades or finishes. There were an array of colours from subtle to bold to tickle anyones fancy, plus a nice range of glitter effects too. I decided on shade 121 which is a pale pink, jelly polish with tightly packed and large pieces of multi coloured glitter. Longeveity: In terms of durability, I must bear in mind that since I am on vacation I have not put this polish through the true test of my usual daily routine or office habits however this polish lasted a good week before it started to chip away, so for wearability I definitely give this one a good thumbs up. Finish: The polish was glossy and and true to colour in the pot. It did need a top coat though to smooth out the surface as I didn’t like the grainy feel of the glitter. However I was pleased with the jelly sandwich effect of the polish. Even thought the colour did eventually grow on me, I did initially find the base colour a little too pale against my skin tone, in fact it appeared almost grey against my yellow tones. Application: It was relatively easy to get a smooth finish probably because the glitter pieces made it more forgiving for any streaks. However I did need to apply 3 coats to get an opaque result. The glitter pieces were evenly spread with minimum effort thanks to the brush that picked up a perfect combination of polish and glitter. The highlight for me though is that it took next to nothing time to dry, which is always a bonus for people on the go, or late night painters like me who always decides to paint my nails 5 minutes before I hit the sack. Summary: A great polish for such a purse friendly price. Formula and application was comparable to high end brands in terms of finish and results. I wish I went for a plain and simple shade instead though as I keep forgetting how much I actually despise taking off glitter polish. The whole polish range itself is beautiful with a good selection of shade to chose from. Definitely a brand to try if you can get your hands on it. Tags: Hong Kong, Innisfree, Jelly Nails, Korean Beauty, Nail of the Day, Nail Polish, Nails, NOTD. Bookmark the permalink. I love that shade… always up for a spot of glitter this time of year! Love your blog check mine out! It looks very nice on your nail. I love it!